A brilliant powerful and important book....This is a brutal indictment Postman has laid down and, so far as I can see, an irrefutable one. --Jonathan Yardley, Washington Post Book World. Marshall McLuhan argued that the medium is the message. And Postman argues that the message of television, our most pervasive medium, is entertainment. Nothing can exist on television, unless it is entertainment. Buried in the maelstrom of his arguments, however, is the correct observation that is some countries television is used primarily as a propaganda tool. He quickly dispenses with this inconvenient fact by arguing it away: in such countries television has not achieved its real potential. If it did, it would be purveying nothing but entertainment. The danger in all this is not entertainment per se, but that people take television programs, especially "60-minutes" and other information/educational programs too seriously. They fall into the trap of thinking that they are well-informed. But television trivializes knowledge by turning into entertainment, making meaningful public discourse impossible. I cannot agree with this, because it contradicts all existing evidence and common sense. First, television, like books, can be used to entertain and to educate. The fact that virtually nothing on television falls into the category of serious education and analysis is not the fault of television. For the most part, people do not want to delve into deep political analysis, and those who do can watch C-SPAN. Also, programs such as can be found on Discovery Science or the History Channel are very education. Postman wrote before the proliferation of cable, which allowed broadcasters to "narrowcast," i.e., to pitch themselves to more narrow, more educated, elite audience. As for the claim that in the past there was some deep sophisticated discourse that does not exist today, I simply do not believe it. Aside from the fact that Thomas Paine's "Common Sense" sold a lot of copies, Postman gives no evidence that 18th century Americans, reared as they were the "Typographical culture," shaped by the written word, were any more intelligent or politically discerning that Americans today. I also don't know what self-selected audiences at the Lincoln-Douglas debates demonstrate about the lack of understanding of major issues today. Jointly, Lincoln and Douglas could speak for the whole day, and there were people there to listen them--also for the whole day, with a major break for dinner, of course. This does not mean they understood politics. Most likely this means that they were entertained by Lincoln and Douglas. They were entertained, and television did not even exist. So according to Postman, there was real sophisticated "discourse" in which ordinary people could engage. But there was also slavery, bigotry, no electricity, and no running water in much of the country. But who can concern himself with such trivialities, in the face of "discourse?" Look, if such sophistication existed, Lincoln would not have felt obliged to talk about pushing for a constitutional amendment to make slavery permanent. Yes, he did that when campaigning in Border States. He would not have chosen Andrew Johnson, a former slave owner, to be his vice president, had he not felt the need to appeal to peace-oriented sentiments of the North. Most likely there was less sophistication and less serious discourse then than there is today. I have uncovered this love for "discourse" not only in Postman, but among humanistic intellectuals worldwide, especially among those who feel they should get a better job or greater status. While they write about social justice and the need for equality; the misery of the proletariat, and the greed of capitalists; all they really want is to have their "discourse," that is to think, to study, and to get worshipped for it. To acknowledge this openly is impossible. So the wretched of the earth become a vehicle of choice for gaining power for humanistic intellectuals. I will be brief about this. Neil Postman's book AMUSING OURSELVES TO DEATH is simply outstanding. As a detailed intellectual analysis, it shows just one reason for the non-book reading, Fox news-watching, anti-intellectual climate that currently pervades the United States in 2008. The causes are many, but have a common thread--television--a medium which has insinuated itself into the mindlessness of popular culture--so much so that any ignorant, but photo-friendly fool or front-man (one old, or younger) along with his right-wing, neo-con, neo-liberal cohorts and advisors can TWICE ascend to the highest levels of political power in the U.S. But Postman was right about Huxley--and wrong about Orwell. While the corporate masters feed the multitudes the utter mindlessness of reality television shows, info-tainment, and religious programming as predicted by Huxley, the thinkers and readers and the intellectuals in this society have been and are presently being subjected to an Orwellian nightmare of total information networking and surveillance. The thought-police are alive, busy, and growing like cancer on the body politic--monitoring computers, chat-rooms, e-mails, credit card purchases, library check-outs, medical, dental, and insurance records, even casino visits; using RFID's, GPS tracking, and even satellite and digital tv's for surveillance--all as authorized by the USA Patriot Acts. Books may not YET be banned (or burned ala Farenheit 451), but those who read them will be watched and monitored. One million U.S. citizens are currently on the Department of Homeland Security's watch list. ONE MILLION!!! Can you feel the heat??? If not, don't worry...be happy. It's all coming soon to more people like you. Be sure to look for it. It's gonna be Hot, and one hell of a witch-hunt!!! "Amusing Ourselves to Death" is an excellent book that everyone living in the "information age" should read. Neil Postman insightfully takes a look at how public discourse has changed as American culture has transformed from a print-based culture to a television-based culture. Postman contends that television has turned everything- from news to politics to religion- into entertainment, and that we no longer take anything seriously as a culture. Postman's book sets out to educate North America about how television is affecting its culture. Sadly, North America hasn't gotten the message because the message is in a book. That's the basic crux of the book. There are no pulled punches or hidden agendas in Postman's book. The problem is obvious, North Americans used to read books for hours on end. They were able to listen to hour long speeches. They were able to make clear rhetorical arguments. Now, after the advent of television, we have become a nation that needs "No Child Left Behind" and countless other educational programs that do little to produce the academics that we want to produce. Postman's book was written in 1985. This just at the advent of the internet. I think that this timing is important. I think the advent of the internet may have changed some of the qualities of what the book has to say - but the basic value of the book is still there. What you will still find VERY relevant is Postman's discussions on how media has changed the educational and cultural landscape of North America. You will also find it very easy to read. I was able to get through it in only a couple of days at about an hour per day...and that's coming from someone infected by the television bug. As a Christian and a seminarian, I found this book a useful tool to understand the culture that I was living in. I'm not sure if Postman is a Christian or not, but if he isn't - he plays one well on TV. He brings up how Jesus' message interacts with people throughout the ages and how the medium of Jesus' message affects the metaphors in which we understand it. In short, Jesus knows communication theory (most likely because He created it). Neil Postman in his book,'Amusing Ourselves To Death', looks at the impact of television culture on the way we live our lives, understand our present and future and how we gather our information. We need to understand the effects of living in a television society. As he says "We are in danger of creating a trivial culture that will spawn a race of people who adore the technologies that undo their capacities to think." Once we are a television society, we have lost control. We can attempt to control television's influence when we understand the dangers. Neil Postman suggests that Americans ask 'what we are laughing about and why we have stopped thinking.' We have all heard the phrase, The Dumbing of America. Roger Waters, of 'Pink Floyd' read Postman's book, and he was so taken with the message that one of the best CD's of this era was written. The song 'Amused To Death" tells us the story. Ackerman tells us that "Television has altered the meaning of "being informed' by giving us disinformation. Disinformation means misleading information;misplaced, irrelevant, fragmented or superficial information. Information that creates the illusion of knowing something but which in fact leads us away from knowing. The television industry did not deliberately set out to misinform us, but when news is packaged as entertainment, that is the result." Over the past fifty years since the advent of television, we have allowed conversation and communication to become trivial, and to lead into entertainment. TV is a medium of entertainment. TV is a series of programmed images and pictures. Unlike a book we do not have to concentrate to obtain the meaning of a picture. This is the mechanism by which TV can make any subject meaningless and trivial. It is possible to "amuse one's self to death", considering that the first thing to go will be our vision of reality and to comment intelligently. And this is why Roger Waters CD "Amused to Death" had the power to unleash our subconscious. We are living the album. We are all slowly amusing ourselves to death. We are entertaining ourselves into a stupor. The best things on television is junk, and no one is threatened by it. We do not measure a culture by its output of junk, but by what we claim as significant. I would think that several minutes of murder and violence would be enough for many sleepless nights. We watch the news because we know that the 'news' is not to be taken seriously, that it is all in fun, so to speak. Everything about a news show tells us this; the good looking newscasters, their pleasant banter, the music that opens and closes the show, the film footage, the humorous commercials. These suggest that what we have just seen is no cause for crying. A news show, is a format for entertainment, not for education or reflection. No one goes to a movie to find out about government policy or the latest scientific advances. No one buys a record to find out the baseball scores or the weather or the latest murder. But everyone goes to television for all these things, which is why television plays so powerfully throughout our land. Television is our culture's principal mode of knowing about itself. Neil Postman says, "For the message of television as metaphor is not only that all the world is a stage, but that the stage is located in Las Vegas, Nevada." We know that no matter how grave news may appear, we soon shall see commercials that will devalue the importance of the news. This is a key element of news and that allows us to believe that television news is not designed as a serious form of public communication. Our teenagers in particular are taught to believe that television is entertainment, so that the nightly newscast should not be taken as a serious responsibility. This past political season is a prime example of the myriad of issues that have not been examined, but the entertainment value of the candidates has been examined ad nauseam. One reason why the political contest starts as soon as the President is sworn into office. What have we become, why are we laughing, the Dumbing of America is here. Postman's book is a harsh diatribe against the television industry and its effects on intellectual discourse in the United States. Postman argues that television, especially when compared to the written word, cannot foster deep, rational thought in its viewers, because it requires absolute passivity from them. Television can only be about entertainment, and its cultural dominance, Postman argues, has had negative effects on education, politics, and religion. The first half the book dedicated to Postman's updating of the famous Marshall McLuhan postulate, "the medium is the message." Postman agrees, but takes it even further, stating in chapter one that "the medium is the metaphor." What he means by this is that our language -- how we communicate -- is only a metaphor for reality. We describe as best as we can what we see and know, but our method of communication circumscribes how and what we can actually communicate. Postman argues that whichever mode of communication we chose to communicate with -- be it oral, written, or televisual -- each comes with its own set of limitations. That is to say, "the form excludes the content." Some ideas simply can't be expressed by certain forms, which should be obvious to anybody who has tried to write a sarcastic email without the appropriate smiley face at the end. Postman then guides the reader through a history of communication, laying out eras where oral, print, or visual communicative forms were culturally dominant. For Postman, the print era (or "age of typography"), which he dates roughly from the Reformation to the 19th century, is when rational argument reached its pinnacle. The form of the written word, Postman argues, requires the marshalling of evidence and the presentation of that evidence in a logical order on behalf of the writer, and patience and discernment on the part of the reader. Only in the printed word could complicated truths be clearly and rationally conveyed. During the 19th century, when print had reached hegemony in communications, rational thought was most most valued. A striking example that Postman provides is the Lincoln-Douglas debates. While these were certainly public spectacles (usually held at state or county faires), Postman presents them as if they were dueling long-form essays. In one particular debate (Peoria, October 16, 1854), Stephen Douglas went first for three hours, after which Lincoln suggested everyone go home to have dinner and come back in the evening. They did, and when they returned they were treated to another four hours of oratory, starting with Lincoln's rebuttal of Douglas. This sounds more like a paper session at an academic conference than a political debate, which is Postman's point exactly. Lincoln and Douglas did in fact write their speeches out, to make sure they made sense, though neither man was insensitive to audience response. In this era -- the era defined by typography as the leading communicative form -- major public figures, be they politicians, preachers, or activists, were expected to be able to make a long, rational, public argument, and the people were willing to listen to it. They weren't bored into a catatonic state by long speeches at all, Postman says, but rather interacted with the orators to encourage them, or challenge them to stay on point. In the modern (television) age, however, things are different. Following the maxim "the form excludes the content," political discourse is no longer about rational argument, says Postman, but about entertainment and appearance. People get bored if television images are too static, so change has to happen, and frequently. There's no time to lay out a rational argument, but no matter, the passive audience doesn't want long, convoluted logic anyway. Television makes its viewers demand constant stimuli, so if things take too long, people just tune out. Debates rarely last even 90 minutes (poor Stephen Douglas), and politicos are lucky to get five minutes on a particular question. Not that they're expected to give a logical answer, anyway. In fact, they can repeat catchphrases as much as they want ("lockbox!" "it's hard work!") as long as they don't look bored (Bush 1992), condescending (Gore 2000), or annoyed (Bush 2004). Who really remembers what was said at the debates in the last presidential campaign anyway? Indeed, did those commenting on the debates immediately following ever really analyze what was being said? In rare cases, such as on PBS, you'd get issue analysis, but for the most part television political commentary was limited to "how did the candidate come across to voters?" "Did he appear honest? Likeable?" Postman says that we're no longer in the Age of Typography, but rather in the Age of Show Business. Television's rules control how we communicate today, even if we aren't on television ourselves. The point is that in the Age of Show Business, nothing escapes becoming entertainment. Postman reserves special scorn for the way education and news are handled by television. The news chapter is specially informative. Our news programs (even the "serious" news shows), he says, are basically entertainment, because they have music introducing ideas and pretty people ("talking hairdos") telling the stories. News items are stripped from local context, commodified, and given to the viewer in bit-sized chunks, separated by the "now.... this!" phenomenon, which serves to make the viewer dismiss it all as meaningless candy he or she can do nothing about. The "now... this!" phenomenon can be tried on any news broadcast. Tonight, for example, and update on the Iraq will be followed by ("now.... this!") Britney Spears' latest escapades. Postman says this serves to reduce it all to meaningless trivia. Neil Postman was a media ecologist. Las Vegas is entirely devoted to entertainment. Journalists spend more time with blow dryers than with scripts. Economics is less science than performance art. There has been a media metaphor shift. Epistemology is concerned with the origins and nature of knowledge. Television is a philosophy of rhetoric. A metaphor of generative force has resonance, acquires universal significance. Truth is a kind of cultural prejudice. The author asserts that public discourse has changed. The settlers of America were dedicated and skillful readers. Knowledge was made manifest through the printed page. Reading was not an elitist activity. The Lyceum Movement had as its purpose the diffusion of knowledge. Oratory was based on the printed word. People of television culture need plain language. The listeners at the Lincoln and Douglas debates were grandchildren of the Enlightenment. Lincoln and Douglas wrote all their speeches and planned their rebuttals in writing in advance. Their listeners were able to process the information. Reading encourages rationality. The printed word in the past had a monopoly on intelligence and intellect. Reading had a sacred element in it because there was little leisure. The telegraph destroyed the prevailing definition of information. The photograph was the perfect complement to the telegraph, a flood of headlines. Unfortunately the sense of context was largely illusory. Currently our use of other media is largely orchestrated by television. Television is now the background radiation of the social and intellectual universe. Every technology has an agenda of its own. American television is dedicated to supplying its audience with entertainment. A television news show is a stylized dramatic performance. Television is the paradigm for our conception of public information. In the age of television the paragraph has become the unit of news. It is now inevitable that Americans accomodate themselves to the philosophy of the television commercial. Television is a speed of light medium, a present-centered medium. Sesame Street undermines the traditional idea of school. Sesame Street does not encourage children to love school, it encourages them to love television. John Dewey said the least important thing about learning is the content of the lesson. Television is the third great crisis in education, following the invention of the alphabet and the printing press. A while back I was exiting an airplane after an international flight on a 747, and as I walked down the aisle I took a long look at about 300 small televisions embedded into the seatbacks of every single seat. This, I thought, was a graphic metaphor of the all-pervasive power and presence of media in our lives. Neil Postman's classic work is one of my all time favorite books, and now it nears its twentieth anniversary. Its cover shows a family of four seated on a sofa and watching television. When you look closely, you see that the artist has depicted them with no heads. Postman reminds us that there are two prominent 20th century dystopias -- Orwell's 1984 and Huxley's Brave New World -- and argues forcefully that despite having side-stepped Big Brother we are letting Soma and the Feelies in the back door. His argument revolves around television especially, warning that this innocuous amusement carries with it the power to destroy us without even a little bit of coercion. Think about the commercial: In 30 seconds it promises a simple solution to every problem in life, suggesting that the way to paradise is 19.99. We are quite amused by these seemingly harmless commercials, but in fact they warp our view of reality to such an extent that real life is sucked out of us. The book is a couple of decades old, so we're missing any analysis of more recent developments in entertainment media, but its prophecies have been proved true many times over since its publication. MTV culture, 24-hour cable news and political pundits, the iPod, and YouTube more than vindicate Postman's warning: We are amusing ourselves to death, soaking in so much vacuous media that we are no longer living real lives. It would be interesting to see his reaction to The Daily Show and The Colbert Report, as they lambast the same ridiculous system he does, but from within the amusing medium rather than from outside it. A particularly nice feature of the book is its media history synopsis. Postman recounts the rise of the printing press, the invention of "the daily news," the impact of the telegraph and television, and so on. Only by looking at history can we hope to imagine a world different from today's, and therefore only by looking at history can we hope to change the world. But this history betrays what I take to be the author's overzealous loyalties to print. I accept that books (real ones, not something by Danielle Steele or Bill O'Reilly) are vastly superior to primetime tv or the latest Michael Bay flick (though maybe not to masterpieces of film), but it looks like Postman is still holding out hope for a thoroughly modernistic logocentric utopia. One of the best points of this book is that the medium itself (and the culture surrounding its use) constrains and even tells messages on its own -- anyone ever wonder why televangelists offer quick fixes for all of life's ailments, just like tv commercials? And while Postman has critiqued the message of TV -- that nothing is so bad that it can't be fixed in 30 minutes, that a mental world is more real than a physical one, and so on -- he doesn't adequately analyze books. If all we're counting on is print, which seems to be Postman's alternative to today's entertainment culture, we're still not living in the real world because we're still living disembodied mental lives rather than real, physical ones. This book's cover picture says it all! Postman convincingly shows us how the medium of television is dumbing down society and distorting our perception of reality (or the lack thereof) in this world and simultaneously affecting our decisions. For example, Postman shows how there has not been a fat or ugly president since the advent of television. As Postman argues, isn't it more important what a president stands for and says than how he stands and how he says things? Interesting, not an easy read but incredibly worthwhile and illuminating! Neil Postman's Amusing Ourselves to Death is a book I would enjoy more if I were in College where they have you study complex words or those you would not use on a daily basis. As a high school student I wouldn't recommend it to those who don't have a dictionary in their head or to those who like to sit down and read a good book. I am in no way saying this is a bad book to read but rather that it is meant for those with a higher level of education than a high school student who doesn't even want to read it in the first place. I found that as I read the first chapter I became lost and didn't understand what it was I had just read. But putting aside how my mental capacity handled the book, when my teacher started to put the book in layman's terms for the class it became clearer what Neil Postman was attempting to make us understand. It is an excellent look into the world of the 1980's and an accurate look into the future. When comparing the predictions in Aldous Huxley's a Brave New World to the predictions of George Orwell's 1984 we discover through Postman's interpretation of what Huxley said was more accurate than anyone could have imagined. I don't see this book as some sort of "I told you so" but rather a "from what I see", more of an observation than a prediction. What I enjoyed most in the book is in chapter 6,"The Age of Show Business"(pg.83), where he talks about the alternate uses of the television such as "an illumination for the written word", or "a bookcase". It amazes me how the TV has become more to us than just entertainment, now it is a status symbol of how well you are doing in life by the size and update in technology. The fact that such a primitive object such as a TV or MP3 player determines our social status infuriates me! I recommend this book to those who have a strong interest on the subject or to those who wish to be informed, but be warned that it is a higher level of reading. This book is for those who have the capacity to understand truly educated people and the language they speak. Neil Postman is an extreme critic against television and its epistemology that differs from the typical typographic mind of modernity. In the first part, he successfully argues that the medium influences the message. However, this is no novelty: philosophy is better written in books than with emails, a dictionary of foreign words is easier produced on a book than a telegraph. Additionally, his analysis of the typographic mind of America seems extreme. Postman is blunt: before television America had the greatest mind, after television America has a shallow mind that just wants to be entertained. While the entertainment industry has undoubtedly shaped epistemology, it seems that more factors should be taken into consideration to analyze one's mind. Logic and reading are only one aspect of intelligence. One can argue that visual, musical, environmental types of learning can be as good as other forms. What seems to have changed might be people's desire to be entertained more often than they used to be, because entertainment is everywhere. In the second part, it seems flabbergasting that a media theorist and cultural critic is unable to find anything positive about television. One might feel that he just dislikes any means of communication that differs from print (i.e. television, photography, telegraphy, smoke signals). It seems that Postman is nostalgic for modernity. He critiques postmodernity, where epistemology is more fragmented, and one's mind is more visual than typographic. However, to be fair to Postman, his analysis of how entertainment has affected public discourse is enlightening. It is indeed a new type of communication that has monopolized the public discourse, and one needs to be aware of the medium being used to communicate a message, because, as we know, the medium influences our epistemology. Positively, the way he contrasts Huxley and Orwell's fear of an oppressive society is fascinating. He states, "There are two ways the spirit of culture may be shriveled. In the first -the Orwellian -culture becomes a prison. In the second -the Huxleyan -culture becomes a burlesque" (155). It seems that those two opposite types of oppression could meet in their extremes. Especially when technological media has been so prosperous, it is easy to think of a society that would use the information and entertainment produced by this technological media to control and oppress its people, without them even being aware that their freedom has been taken away. Reading this book made me understand how the shift from modernity to postmodernity might have taken place within the media. Postman made me realize that to understand the media helps to understand how a society thinks and functions. They say, "you are what you eat." Neil Postman takes this to it's next logical step. "You are what you experience." Mr. Postman focuses on two inventions, the telegraph, and the photograph. One allowed news from across the globe to fill our brains with so much junk information, that trivia games had to be invented to make use of it. The other allowed the world to be presented in a disjoint way, such that an image of a tree you walk by everyday, can be taken in such a way that, while you're assured it's real, you do not recognize it. Television, according to Mr. Postman, is the child of these two inventions. By taking us back in time 150 years, this book looks at famous speeches to examine the capability of the minds of both the speakers, and the listeners. Once these speeches are analyzed, the author barely has to give examples of present-day speech to make his point. It is obvious to anyone who has listened to any recent presidential debate, that this level of dialogue and logic does not exist anymore. The brain is an incredible, organic machine. But it is only programmed in one way. That is through experience. So if all it is presented with is 30-second sound bites, and paragraph, or even sentence-length logic, then that is how it will "wire" itself. The next time you hear that students are not being taught history, you may want to consider if they are even capable of retaining it. Appropriately, Neil Postman invites serious consideration of Huxley's 'A Brave New World', with it's more willing inhabitants, as the more likely dystopian future, rather than Orwell's '1984'. With wit, subdued (but real) erudition, and prophetic accuracy, the late Neil Postman exposes and exegetes the form or nature of television. This book is not a screed against "what is on TV," but an analysis of "what TV is." Although written over twenty years ago, the arguments are not dated (although some of the illustrations may be). TV, according to Postman, has debased public discourse because of its incapacity to sustain critical thought--about politics, religion, history, or anything. Postman declines to go so far as McLuhan in saying that TV alters our very sensorium (a proposition I agree with), but he finds TV to be a ubiquitous and dangerous feature of American life. It has become our very epistemology, the way we process reality. Ah! What a succinct and clear explanation of how the world of imagery has overtaken the world of writing and how this change has affected the human psyche. Postman elaborates, with hundreds of examples, how TV has changed the way we think and act in today's world. He compares it, with no small authenticity, with the words of the likes of Lincoln and Douglas and how people in those times were ready to spend an evening listening intently to speeches delivered by these great men. Not now, not today: we are slaves of the Show Business syndrome now. Overall the book Amusing Ourselves To Death, written by Neil Postman, was an average book. Neil Postman wrote about what he thought our society was going to be like twenty years into the future, remember the book was written twenty years ago. Once I began reading the book I was really interested in what he had to say because he predicted what is occurring in our society at this moment. After reading the book I realized that he was right. People are completely sucked into their I-pods, Sidekicks, Blackberries, or other electronic devices. "They have not realized the effect that it will have on our future" is basically what he is saying. Postman's point is straight forward he does not beat around the bush he believes that we are going to become dependent on electrical devices and he believes it strongly. In chapter four " The Typographic Mind" Postman wrote about debates and how now people can barely stand to listen to a two-hour debate let alone a seven-hour debate that president Lincoln and Douglas would have. He writes "These were people who regarded such events as essential to their political education, who took to be an integral part of their social live..."(Postman, 44). "Is there any audience of Americans today who could endure seven hours of talk? Or five? Or three?" (Postman, 45) Think about this question for a second is he right? If you believe that our society has lost its souls to technology then this is the book for you. Many of the things will have you saying "oh yeah, that is true". Not only did the book interest me because it was right but also because it was written twenty years ago. Overall though this book was good but not the best. Some of the information in the book was really repetitive but it made the point of the book clear. This book outlines how American culture has declined from reasonable discourse to trite, shallow and (largely uninformed) opinion-based mindlessness as a direct result of the technology we use to communicate. Written decades before the proliferation of the internet, mobile phones and instant messaging, there now can be little doubt of the validity of Neil Postman's conclusions. Sound bites, extremist talk radio, political spin and reality TV have further degraded our civility and tastes over the last 20 years. Even amongst the literate, the many uncivil and ill-conceived comments posted to Amazon support his premise. Unfortunately, the author's proposed solutions are weak. Further, his academic and formal writing style makes for dry reading. Perhaps that was an intentionally ironic decision to be contrary to the show-business culture we have become. Thankfully, the text is sprinkled with some wry humor from time to time. A very well-written and scary book about how television's strength (entertainment) has corrupted news content and political discourse. Starts where Orwell, Huxley, and McLuhan left off. In spite of the serious subject, many funny parts. Neil Postman is a prolific author and social commentator of the end of the 20th century. Over 20 books written on media, technology, and education. Startling expose of the future of our culture. Neil Postman's thesis in Amusing Ourselves to Death is simple. In his eye-opening work, he demonstrates "how forms of public discourse regulate and even dictate what kind of content can issue from such forms" (6). In other words, the way something is communicated controls what is actually being communicated. The forms of media are not merely neutral channels through which facts and ideas flow. Those forms themselves either taint or enhance the message. Based on this premise, Postman demonstrates the dumbing influences that the television has had upon modern American minds. By doing so, he contends that a culture based on words is superior to one based on pictures. The book is an apology for reading. Though it was published in 1985, it has equal, if not more, relevance to us today. To begin, Postman argues that every medium of communication carries with it an epistemology, a theory of knowledge. For instance, "`Seeing is believing' has always a preeminent status as an epistemological axiom, but `saying is believing,' `reading is believing,' `counting is believing,' `deducing is believing,' and `feeling is believing' are other that have risen or fallen in importance as cultures have undergone media change" (24). He demonstrates that the Jewish concept of God, with their application of the second commandment, taught them a very high form of abstract thinking. The reader must persevere during the first two chapters because his reasoning, though tight, can tend to be somewhat thick. Beginning with chapter three, Postman gives a historical survey of America's way of thinking, as dictated by its forms of communication. America began as a typographic society. Reading and writing were valued greatly for many reasons, not the least of which was that people could read the Bible. All people recognized the value of knowledge. As a result, people would gather in droves to hear lectures and debates. For instance, people in the 1860s were captivated for 4 or 5 hours at a time by the meticulously reasoned debates between Stephen Douglas and Abraham Lincoln. Frequently, they even lasted for more than one day! Postman shows that "a language-centered discourse such as was characteristic of eighteenth- and nineteenth-century America tends to be both content-laden and serious, all the more so when it takes its form from print" (50). A transition began, however, with the telegraph, which "made a three-pronged attack on typography's definition of discourse, introducing on a large scale irrelevance, impotence, and incoherence" (65). Hence, there arose "context-free information," mouth-sized bytes of information with no true relevance to one's life. Neil Postman does an excellent job explaining why he feels that television has degraded communication in our society. If the message is affected by the medium, it may well not be the same message, or only a simplistic rendering of a deeper thought. He goes on to discuss, how society today communicates as well as how it now educates. Since TV has done so well, to grab children's attention, the educational system is modeling itself after it. Now instead of bringing ourselves to the messenger (as they did in the time of the written word). We expect the messenger and the message to come to us. Of course it has to be packaged in a fashion we will accept: Entertainment. Children and Adults are being trained to expect entertainment out of the most mundane or tragic events. Consider the nightly news, its sound bites and sound track. The worst events of the day are being pre-packaged to make them more palatable or interesting, so viewers won't change the channel. Additionally, we are being deprived of information we do need to be concientious adults in our society, not by any "Big Brother" restricting this information, but by the shear glut of information that clouds what we truly need to function. If you think of advertizing, how much of it discusses the features of the product versus how much advertizing emphasizes psychological points of how great we will feel if we buy this product. Given the date of the book, he only touches on the medium of the internet. However, when I've reviewed usability texts on internet design, they are clearly designed for the television watching audience. There is great emphasis on sound bites and organized groupings of information, clearly designed for those of us with short-TV-based attention spans. Just today I logged on to one of the biggest news channels' website (CNN) and on the front page under "Popular News" was the following headline: "Is that Miley Cyrus flashing her bra on the Web?" I had just finished my second reading of this book and it seemed like a stark reminder of what Neil Postman was talking about over 20 years ago, how television has drastically changed our culture and redefined everything in our society from news to politics, education and even religion. I don't know of any book written during my lifetime that is more socially relevant and whose message is more important to be read and understood by the general public. In Chapter 6, "The Age of Show Business", Postman writes, "To say television is entertaining is merely banal. Such a fact is hardly threatening to a culture, not even worth writing a book about. It may even be a reason for rejoicing. Life, as we like to say, is not a highway strewn with flowers. The sight of a few blossoms here and there may make our journey more endurable." He goes on to point out that the problem is not that there are entertaining shows on television, but that in order to accommodate itself to the demands of television, *everything* must be presented as entertainment. In order to generate ratings, advertisers and ultimately revenue, no subject is too serious to be presented in any way other than the one that attracts the most viewers. When the local news reports about a murder, it has no relevant meaning to our lives and it's not told so much to inform us of the tragedy of a murder but because it is the most exciting and what people want to see. News producers have a motto for this, "If it bleeds it leads." Probably the most alarming example Postman cites is how television has changed politics and political discourse. This is where the transformation from a word-based media to an image-based media is felt the most strongly. Politicians have realized that the content of what they say is now largely irrelevant compared to how they appear, how they present themselves. Postman uses the example that when Ted Kennedy made a run for the presidency, Richard Nixon offered him the following advice: "Lose twenty pounds." Nixon had been in politics most of his adult life and knew the name of the game well, that one's ideas, beliefs, actions and words are now almost completely irrelevant in a world where nearly everyone has started getting their information from television only. Before Mike Huckabee entered this political race, he lost over a hundred pounds. If you look at photographs of presidents throughout our history, you notice that most of them certainly never got anywhere in life because of their looks and some of them are downright ugly men. Political races are now completely decided in the arena of television and their coverage of it has become absurd and embarassing. This is the change that Postman has tried to point out, that a literate culture that depends on the printed word for information and communication creates a vastly different culture from one that depends on images, ten second soundbites and information that has no context or relevance to anyone's life, like what Miley Cyrus or Paris Hilton is up to. Postman makes a convincing argument about the effects of commercial television as America changes from a print-based culture to a visual one. The book is divided into two parts. The first gives an analysis of the media today, and the second provides examples of how television has drastically changed curricula in schools, altered the way our elections are conducted, and even affected how we practice religion. The author's thesis is that all of these activities must be done theatrically and within certain visual constraints in America today. Although Aldous Huxley, who is cited several times, makes the initial, dire prediction about where our society is headed, it is Postman who gives specific examples of how Huxley's predictions have been fulfilled. Postman does not have a problem with television when it is used for its purpose: to entertain. The trouble arises when television is the medium culture uses for its news, religion, politics, and education, turning all these activities into forms of show business. The result is that culture is trivialized and people loose their capacity to think, eerily similar to Aldous Huxley's vision in `Brave New World'. Being a visual medium, television limits ideas that are communicated to those that are simple and change constantly. Unlike the printed word, television is unable to perform an in-depth analysis of a news story or discuss complex political theory. In addition, television impacts the expectations children have in a learning environment and the teaching options available to educators. I'm sure I won't have anything to say about this book that someone else hasn't already said here. Yes, the book is now almost 20 years old, so it takes some memory stretching to get back to some of his examples, but it is perfectly clear that nothing about television has really changed, at least not for the better, since publication. Even though this book has very little to say about religion, I would love to see churches study this book in small group meetings. Since pretty much nothing has a greater influence on our culture than television, it is worthwhile to take some time and look at what telesision means and how it works as a medium. For those unfamiliar with the book, I will just say that one of the greatest insights I saw in it is that tv is at its worst (and possibly most dangerous) when it attempts to be "serious". While this book was written in the mid-1980s, it is very applicatable today (if not moreso). Postman's basic premise is this: Television trivializes public discourse in many ways and we need not fear an Orwellian "Big Brother" but rather fear a Huxleyan society of happy and sterile citizens. I was inspired to pick up a copy of this book after I heard an interview about Postman on a recent NPR "On The Media". I was very pleased with Postman's concise and academic approach to television. His writing is very succinct and he uses good examples to drive home his points. 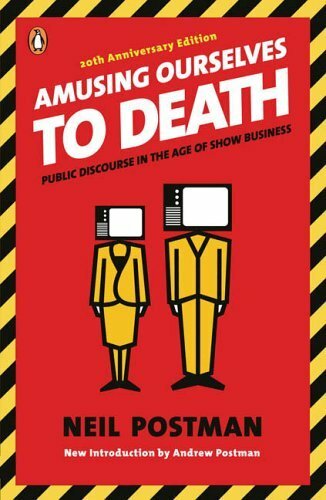 In Amusing Ourselves to Death, social critic Neil Postman takes aim at the role that TV plays in degrading the quality of public discourse in the United States. Postman's central argument in AOTD is that US citizens are allowing the government to take away their rights because the citizens are not sufficiently well informed to oppose the government. Postman maintains, therefore, that it is Aldous Huxley's Brave New World that represents the nightmare in which we live; Postman says that, in Huxley's world, "...there would be no reason to ban a book, for there would be no one who wanted to read one" (p. vii). As Postman sees it, it is TV (and the useless ocean of trivia that TV broadcasts) that has created a passive, uninformed American populace. There are many things to like about AOTD. The book is ambitious, in that its 163 pages contain both a media history of the U.S. and a discussion of the media's effect on the United States' intellectual climate. Another aspect that I enjoyed (as a college professor) was Postman's discussion of how educators increasingly face pressure to entertain in the classroom; I think that any teacher can relate to this material. Postman has a great, involved discussion on the nature of television that will make readers think; TV is "...a way of understanding the world that is not problematic, that we are not fully conscious of, that seems, in a word, natural. ... a way of thinking that is so deeply embedded in our consciousness that it is invisible. ... Twenty years ago, the question, Does television shape culture or merely reflect it? Held considerable interest for many scholars and social critics. The question has largely disappeared as television has become our culture" (p. 79). Other aspects of AOTD are not as positive. The writing is a mixed bag. At times, Postman shows a wonderful, dry wit. For instance, he discusses a publisher who maintained that "...a newspaper in Boston was necessary to combat the spirit of lying which then prevailed in Boston and, I am told, still does" (p. 36). There are several witty jabs in the book that often take the reader by surprise. Unfortunately, Postman can also lapse into academic "gobbledygook" that can be very tiresome. A general criticism of AOTD would be that Postman does not do enough to acknowledge information that runs counter to his thesis that TV destroys U.S. culture. I think that Postman greatly overstates the case when he discusses how much more literate the U.S. public was in the 1700s and 1800s. After all, in the 1900s there were dramatic increases in IQ scores among U.S. citizens. (This is the so-called "Flynn Effect"). How did this happen if our minds were rotting under TV's influence? In the end, Postman's greatest accomplishment is to write about the "big" issues facing our world; I suspect that relatively few readers will find themselves unmoved by AOTD. As to whether Postman is correct or not, each reader will have to decide for him- or herself. This is a great book that will help you to think critically about television viewing. For many Americans, their lives are structured around watching TV; from the the morning news over breakfast to the prime-time shows before bed. Amusing Ourselves to Death reminds us that television is first and foremost about entertainment and excitement-it's what television does best. The book tackles a variety of topics including news, education and politics on TV. The book warns us that television has shaped the way we view reality so that the entertainment values of TV have ultimately become our values. I read this book at the suggestion of my high school English teacher back in 1996, and find myself still aluding to it today. He makes the argument that America's attention span has been shortened by television, among other things, and that this explains a good deal of our political history. Think about how the soundbite has limited the ability of American's to actively engage in political discussion; how much you multitask now that you have IM and email and TV and radio and 30 seconds ads all blasting at the same time. This book is important for anyone who is concerned about the proliferation of television in our society. Actually, it should be read by everyone, if only to make people think about what television means to our society. He compares American TV to Huxley's Brave New World, and it's been a while since I read that (may have to go pick it up again), but I get it. His point is that we don't have anything to fear from an Orwellian "everything is monitored and prohibited", but that we are overwhelmed by meaninglessness through TV and therefore cannot have a meaningful discussion about anything. Everything is conscripted to sound bites and visual stimulation. Everything is trivialized. And it's true -- when I was reading this, I found it difficult to concentrate and would take breaks, check the internet, etc. We just don't have that attention span, and I agree with him that it's in large part because of television. This book was written in 1985, and I found myself wondering what he would have made of the internet -- like television, we're able to click something off if it's not instantly entertaining. I also wonder what he would say about the 100 channels we can now watch, instead of the three he was speaking of when he wrote this. Things are even worse now. Postman's book is a cause-and-effect cultural polemic, warning us that public discourse is dissolving into "the arts of show business" and "vast triviality" (p. 5 and 6), and he puts the blame squarely on television. While the argument is worth making and the debate worth having, his philosophical waxing leaves me wanting to say the least. For example, he opines that a fat man could not run for President of these United States today because the "grossness of a three-hundred-pound image (on TV) . . . would easily overwhelm any logical or spiritual subtleties conveyed by speech." (p. 7) There is no acknowledgment from Postman that obesity is a serious health concern and in an era in which those health concerns were and are well known, it is not unreasonable to infer than an obese person lacks personal self-discipline and will power, two characteristics reasonably desirable in the leader of the free world. To counter Postman directly, the shape of a man's body may, in fact, be quite relevant to the shape of his ideas. Additionally, in a world of nuclear proliferation and persistent and consistent armed conflict, it can be argued that an unhealthy President poses a national security threat. Many of Postman's premises underpinning his theses seem to be ill-formed or just plain illogical. Take for example his surprising suggestion that "half the principles of capitalism . . . are irrelevant" and "that economics is less a science than a performing art." (p. 5) Economics at its core is the study of how societies allocate their limited resources, and to reduce this to a performing art, even hyperbolically, undermines the argument being made. The economics of capitalism are far too regarded to simply be carelessly sacrificed on his rhetorical altar without considerably more evidence than Postman provides. He offers only the uncredited observation that "American businessmen discovered . . . that the quality and usefulness of their goods are subordinate to the artifice of their display." (p. 4) While peripherally true, this has little bearing on the relevance of capitalism or the rigors of economic study. Perhaps Postman's own public discourse should be elevated. Similarly, his contradictory suggestion that "people of a television culture need `plain language' both aurally and visually" (p. 46) is patently absurd. On the one hand, Postman rails against television for dumbing down our public discourse, then on the other, suggests dumbed down discourse is all a television culture can handle. Perhaps a wiser argument could be made favoring elevated discourse in our television programming rather than presuming those that watch television are too stupid to understand it. I have cited but a handful of examples in Postman's book of how his thesis is weakened by seemingly plausible but ultimately misleading arguments. But the same can be said of his thesis as a whole. Public discourse in this country was not weakened by the advent of the television; it was weakened by the advent of weak public discourse. Television is not the cause of weaker public discourse, it is the result of it, notwithstanding Postman's unpersuasive intimation (chapter 2) of a media-induced epistemological shift (e.g. we no longer communicate through symbols carved on cave walls and I dare say we are no worse for having lost that mode of communication and arguably better). Postman provides little evidence that television has damaged America's body politic or retarded the growth of our intellectual discourse, public or otherwise. The contribution of television to historic, citizen-based changes such as the Civil Rights movement, the Vietnam and Iraq wars and the protests those wars spawned, the environmental movement, and even the end of the Cold War deserve discussion in any examination of media and politics, yet is completely absent in this brief volume. Postman's dissertation about how the pre-television age empowered our citizens fails to acknowledge any of America's infamous atrocities (slavery, Native American genocide, etc.). It would be erroneous to assign sole responsibility for any of these social events to a single dominant form of media, but Postman seems to do just that with regard to our modern ills, of which there are not only plenty, but plenty of causes. In largely ignoring the relationship between media and the social events of the day that also define "the television culture," Postman's arguments for media influence seem both irrelevant and na?ve. Television is a reflection of society and none of society's ills can be cured by simply breaking the mirror. As Aristophanes famously said, "Youth ages. Immaturity is outgrown. Ignorance can be educated, and drunkenness sobered, but stupid lasts forever." Stupidity is as old as the human race and as long as stupid people exist, there will be stupid shows to watch on television. Does anyone really believe public discourse in this country can be elevated by simply getting rid of the television?